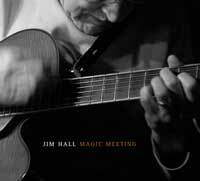 4/20/2019 6:12:30 AM - Jim Hall, born in Buffalo, and educated at the Cleveland Institute of Music, moved to Los Angeles where he began to attract national, and then international, attention in the late 1950s. By 1960 Jim had arrived in New York to work with Sonny Rollins and Art Farmer, among others. His live and recorded collaborations with Bill Evans, Paul Desmond, and Ron Carter, are legendary.